Heathered grey BIKELIFE v-neck tee with light blue design. Shirts are 100% soft cotton. .. 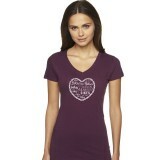 Plum BIKE LOVE v-neck tee with white design. Shirts are 100% soft cotton. ..
Ride Free! 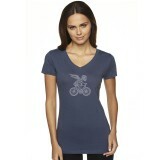 Women's Black v-neck tee with metallic gold bicycle component butterfly design. Shirts..
Ride Free! Women's Lilac v-neck tee with violet bicycle component butterfly design. Shirts are 10..
Women's Black v-neck tee with pink chainheart design. Shirts are 100% soft cotton. 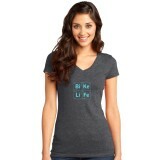 ..
Women's Grey v-neck tee with teal chainheart design. Shirts are 100% soft cotton. ..
Heathered navy VeloBones v-neck tee with light blue design. Shirts are 100% soft cotton. In-S..